A few of you said that you were going to join me on my half-finished project challenge, so how are y’all doing on it? My work on my list got off to a late start because I was too busy obsessing over my pixel art that took an obscene amount of time. But I’m off to the races now. 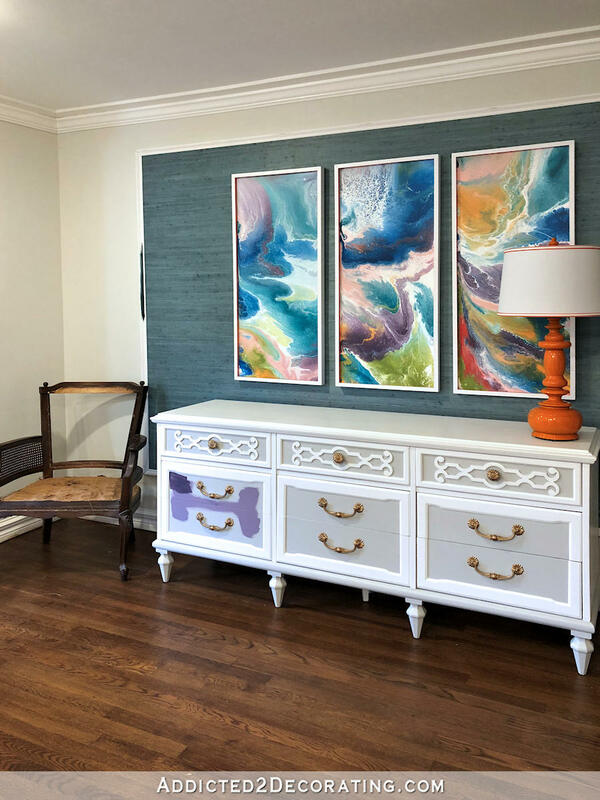 I decided to ease myself into things by tackling the two easiest projects on my list — the credenza and the frame around the grasscloth. The credenza is one that I found at a local second hand store, and I originally painted it white and gray. So why did it need to be repainted? Because, the gray that I used turned an awful shade of light purple during the day. I do decorate with purple, but this super light, icy purple was just all wrong. …but the light purples that were close in color to the living room draperies looked horrible, and I didn’t want a deep purple credenza since I already have the dark purple buffet in the breakfast room. So I went with green. That’s definitely more “me” than an all-white credenza would have been. The color is one that I mixed myself. I started out using Behr’s Fresh Olive. That color looked great on the small sample that I painted, but when I painted a larger portion of the buffet with that color, it just fell flat and looked dirty and dull. 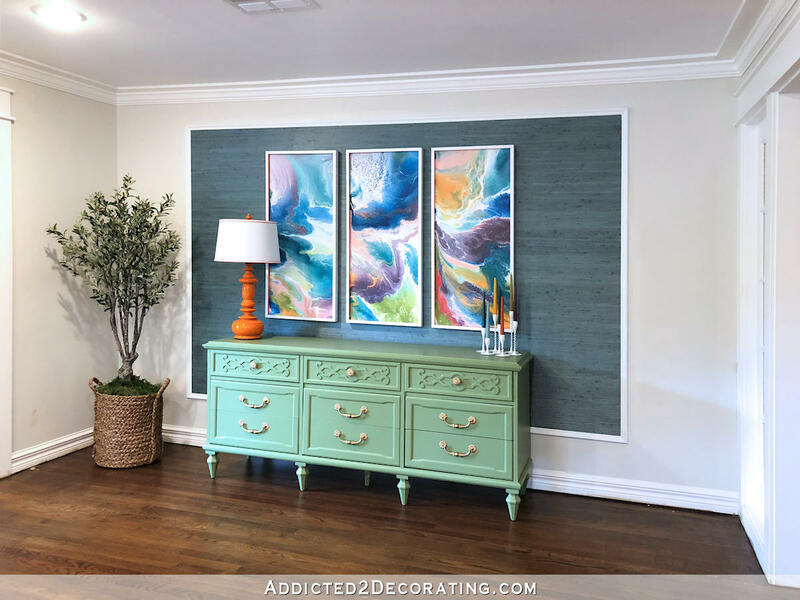 I didn’t want to select another color or purchase more paint, and I knew I could brighten and freshen up the olive with the addition of the right green, so I rummaged through my massive collection of paint samples to find a truer, clearer green. I found a Behr color called Deep Viridian. It’s a fairly dark green, but it’s also a truer green, so I added just enough (about five or six ounces) of it to the quart of Fresh Olive (I had to remove some of the Fresh Olive to make room for the needed amount of Deep Viridian) so that it would cut the dull and dirty look, and give the green a brighter, fresher, cleaner look. You can see the two here. 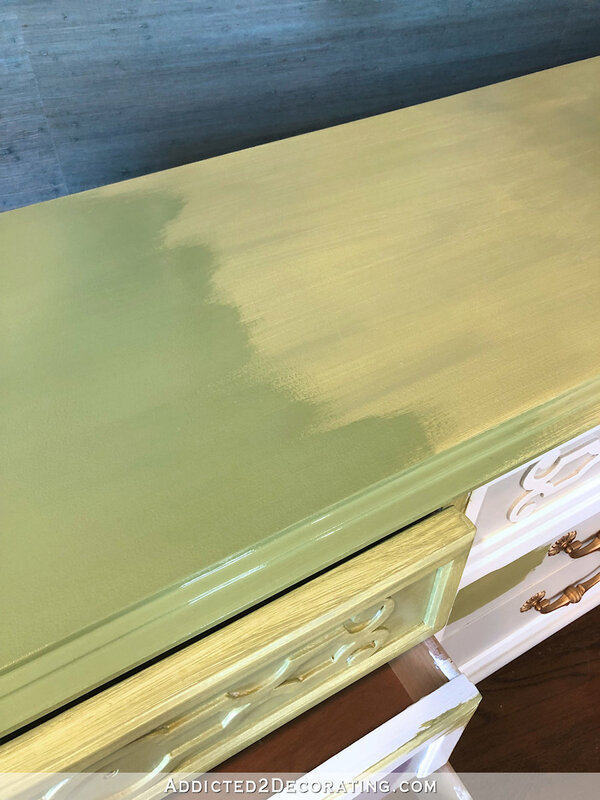 I only painted one coat of Fresh Olive on the top and the drawer, so it’s very streaky. 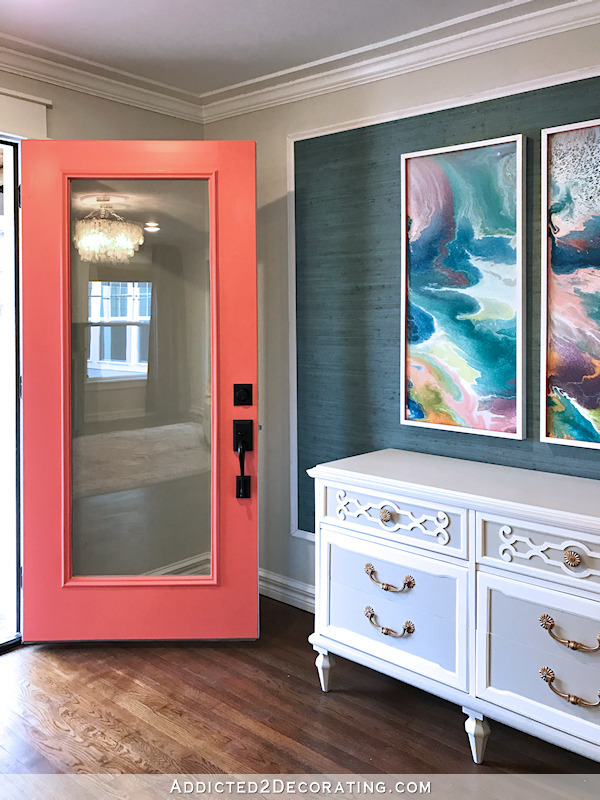 But you can imagine how much darker and duller it would be with a second coat, and in fact, you can see some streaks where the paint is thicker that will give you a good idea of what the color would look like with a second coat. The custom mix on the left has a brighter and cleaner look to it. I don’t know why, but I thoroughly enjoy mixing my own paints to get exactly what I want. 😀 And this is what I ended up with. 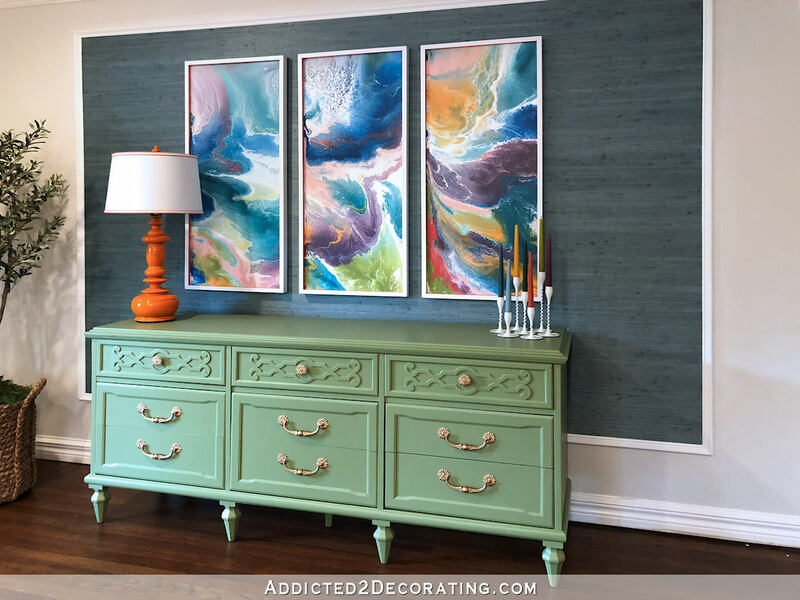 I like that it adds color to the room without overpowering the paintings, like a bold, warm color probably would have. And entire credenza painted in orange or pink or coral or magenta would have completely stolen the show from those paintings. And as you can see, I also got the frame around the grasscloth painted. I had in my mind that panting it a dark teal would look great and tie in with the fireplace on the opposite wall. I was wrong. Very wrong. Surrounding the grasscloth with such a dark teal made the color of the grasscloth look completely washed out in comparison. It looks so much darker and richer with a white frame. So that’s two of my half-finished projects done. Although while I was painting the frame around the grasscloth, I realized that I never did finish painting the baseboards after I refinished the floors the last time. There’s still stain on the baseboards in some areas, so that certainly qualifies as a half-finished project. 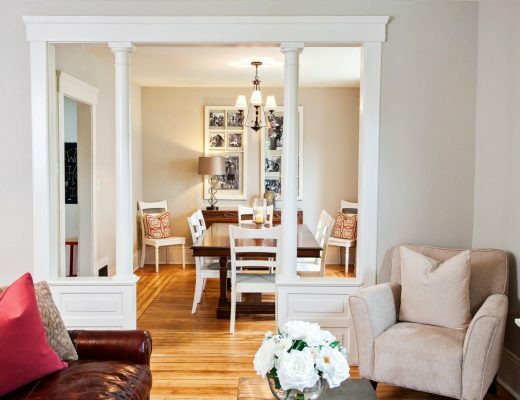 It’s just the music room and living room/entryway that need baseboards touched up, so I should add that to my list. 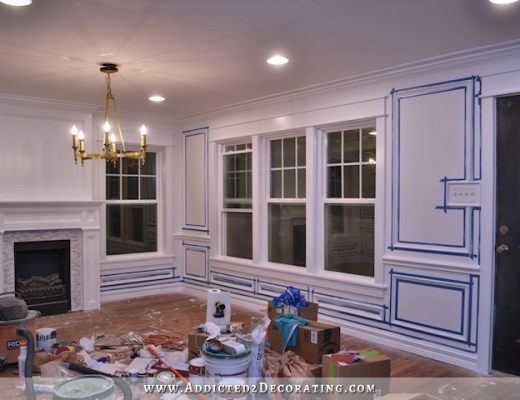 The other projects still to go are the music room walls, the second living room drapery panel, the shutters for two windows, and the front porch ceiling. And I have 22 days to meet my goal. I’m pretty sure I can do it. So how’s your list going? Previous Post New Concrete: To Stain or Not To Stain? Looks gorgeous (of course!) I love your bold color choices. Looooove the shade of green you mixed up! The end result is beautiful! Glad to see you are getting your list done! I agree! That green is a great shade and tone! I was hoping it was a standard color, so I could buy it for a secretary I want to paint! I had planned on using chalk paint, just because I didn’t want to deal with sanding it, but I revisited your post about why you don’t use chalk paint, and was convinced. Plus, the cost is not worth it either. I refuse to pay almost $30 for a quart of paint I may not be happy with. I’ll just stick to something I know. I agree, color is what was needed. Looks great with your paintings. Also, where did you get the candle holders? I found them on Etsy. They’re a vintage brass set of seven candle holders that I painted white. So love that green. All your colours look wonderful together. Beautiful! Did you paint th grass cloth yourself? Can you even paint grass cloth? 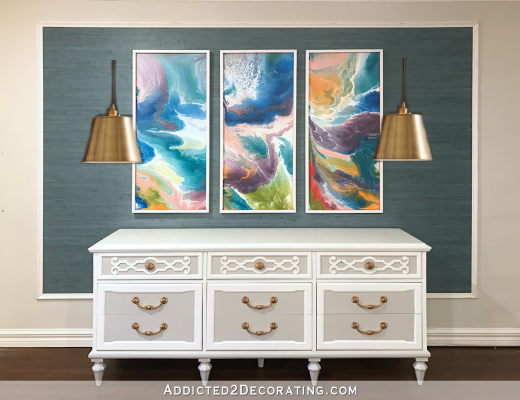 You are not just a decorator, you are not an artist either, you more than a poet, you are a MUSE – a creative inspirational diva! She painted the frame around the grasscloth, not the grasscloth itself. I love the credenza color!!! May I ask…when you mix your own paints, do you use a mixer/drill thingy or do you just manually mix it yourself with the wood paddle until you feel it is mixed thoroughly? I like the soft green, and I like that the credenza is all one color. Having the drawer panels a different color than the background broke it up too much visually and competed with the paintings, imho. I’ve been catching up on a number of projects that we’ve had ongoing since the flood too, and it does feel good to get them done. I finally painted a console cabinet I’ve been planning to since I bought it two years ago. It went from a dark mahogany stained finish that was too dark for me to Benjamin Moore’s Old Navy. I just have to put the poly coat on it tonight and put the doors, shelves, and hardware back on. Yippee, another check in the completed box. I don’t know how you do it all!!! I love the credenza color!!! May I ask…when you mix your own paints, do you use a mixer/drill thingy or do you just manually mix it yourself with the wood paddle until you feel it is mixed thoroughly? LOL . I just spray painted a set of those brass candlesticks white and sold them on ebay!!! I’m sorry but the green is not good with the grass cloth! Plain white would look better than green. To each his own! I didn’t like it either when I first saw it. Then as I looked and stared, I began to see her point and her vision. The more I see it the more I realize it works perfectly. There is such freedom in not being afraid of color! Look around at God’s incredible palette and don’t be afraid to look with new eyes. Unfortunately, I’m in agreement. I don’t think I would like plain white, either, though. I was really voting for the deep purple. BUT, it is not my house and even thought I wouldn’t have picked that color, I’m down with it. The green is definitely an improvement over the lavender-gray! Things do look different IRL than on a screen but this shade of green looks like “hospital” green. I like the intensity but think there needs to be more yellow in it to make it sharper. This seems too “soft.” This shade probably goes better with your loveseat than a green that veers a bit more yellow would, though. I agree. I believe my aversion to green is due to my 30 years of working in a hospital! While I did love the dark green kitchen (it grew on me!) I was happy to see it repainted with teal. Beautiful. In the back of my mind, I had the idea of this credenza being painted the same color as the fireplace. But then I’m no decorator & often fail to see the big picture, unlike Kristi who has that amazing ability! Whatever the color, I’m quite sure she will pull it all together for a beautiful room! Yeah I would choose another color. If you’re going bold I liked purple or the two tone. Otherwise I liked bright white. Kristi, I LOVE, LOVE, LOVE your choice. The color pulls out the green from your art piece but doesn’t steal the show. Just beautiful. I’ll share your picture of it with Rut (Ruth, in English) and Luis, the owners of the paint store I frequent here in Macas (Ecuador). They continue to be amazed at what you do. They smile when I open my iPAD. As for my list: I am ready to do an accent wall in my bedroom and also paint my entertainment unit black. I want to ask advice about painting something else, which just occurred to me as I am typing this. Hmmm, I bought a second-hand hassock on a recent trip. I call it “mi vaca” (my cow) because it is covered with patchwork pieces of faux leather of very dark brown and cream. It is round, 18” across, and the sides taper toward the floor. So, I like the design, but would prefer it be one color. Of course, I can make a cover of fabric, (I would need to insert a zipper to get it on and off for laundering) but—what about painting it to get exactly the color I want? I don’t want to feature it, so the color choice would not be hard. The question is, would painting work on such a material? If so, is there anything I need to know to prepare it and/or do it? Ideas from anyone are welcome. Many of you who leave thoughtful comments, have helped me many times, and what can I say about Kristi’s willingness to share her ideas, techniques, even goofs. Thanks to you all! Love the green. And although I’m not an abstract art lover I love the flow of colors in your paintings. Everything ties together beautifully. Great job! I have far too many projects going all at once but my biggest are repainting the kitchen cabinets and planting my rose garden. The outdoor work is done in cool mornings, the painting later in the day or on rainy days. Lots of work but i’m steadily getting it done. 6 months later all the paint is chipping off. Should I have sealed it with something. This was my first attempt at painting something other than a room. That green looks SO good with everything else. I’m really glad you didn’t my go with purple or magenta. I guess I’m still a bit of a purple hater! My goal this month is to get the rest of the built ins done in our little living room. I’m pretty sure we’ll be able to do it, even though the first part took us two months to do… but that involved dismantling a closet, and we took two weeks of holidays and finished some other necessary tasks in that time. Is it just my eye and/or my monitor? I see subtle undertone of faint green in the grass cloth. 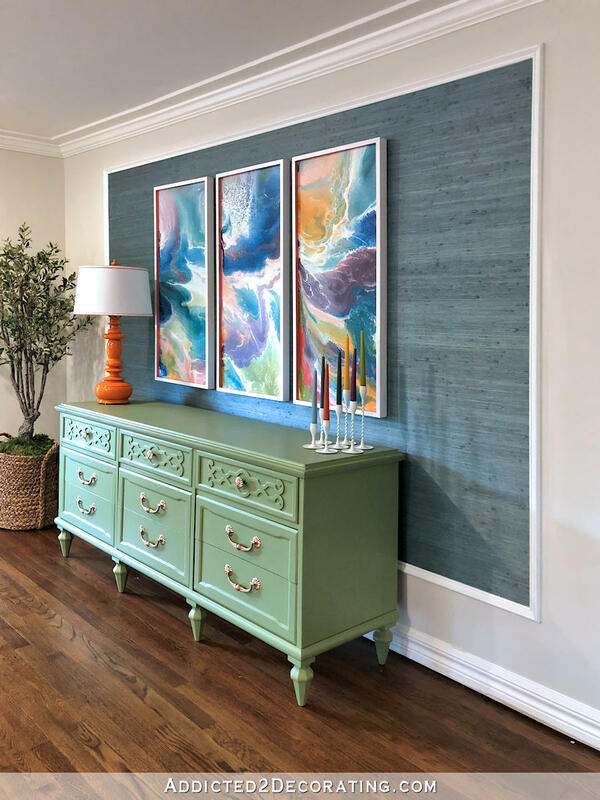 Did Kristi see that also, in addition to its presence in her art piece, thus her decision to go with green for the credenza? The choice certainly avoids a matchy-matchy result the way any variation of purple would have done. White? Not good to my thinking, so I’m glad it isn’t. We don’t rule out placing a green plant in a room because it doesn’t ‘go’. I am so glad the credenza is one color. Now I’m done for this round. It’s definitely more of a yellow green, while the loveseat verges more towards a blue-green. But somehow they work together, at least to my eye, without the room looking too matchy-matchy. Oh, and don’t let the naysayers bother you 😂😂😂 It is beautiful! I certainly don’t consider those that don’t care for the color as naysayers. They are just expressing their opinion just as those who do like the color. I would bet Kristi appreciates all opinions. That is how we all learn about choices and differences. I love the green with orange lamp and the painting colors! I vote color over white 99% of the time! I love the green. It brightens things up and, along with the white trim, makes the grass cloth sharper. It appeared to be a dusty teal before. (Of course that could just be how it appeared on my computer.) I love your use of color. This is so much more you. That they look wasn’t such a departure. Love when you find you again. So glad you completed some of your half finished projects! You are making amazing progress. My half-completed projects were on the back burner due to work schedule, but I am attacking one of the projects this weekend. The plan is to paint the master bedroom (again…..for the fourth time!) and hopefully the gray will come out the way I want it to this time. Kristi, I don’t know what else I put on the list…can you post a link to the challenge again? I love it. My eye immediately picked up the green in the art work. I had been focused on the blue. I then looked longer and picked up the Orange! I love this vignette! When reading that you painted it green, I was expecting a color similar to what went on your new mirror in the music room, and got a very good surprise when I actually saw the picture. That looks good! It’s complimentary, and a nice soft color; not a harsh yellow-green, and not blue enough to look like yet another variation on teal. I really love the color, it’s perfect. Some people may prefer white, but I think it just would have looked bland. All of my half-finished projects are sitting in a pile next to the sewing machine! Finicky old machines definitely make it a chore. Nice color choice on the credenza. Will you be changing the color of the orange lamp also? Just now read this post. Love the green you mixed. I love most shades of green as you would immediately notice if you stepped into my home. I did feel something was off when I looked at the photos and it took me a little while to realize that the very first thing I saw when viewing the photos was the orange lamp. To me it seems to draw attention away from the rest of the items. It is probably just me since no one else seems bothered about it. Also, you can see everything much better than I due to the color differences of different computer monitors. It is so good to see your progress. Thanks for being the inspiration for us to get all the unfinished projects (and chores) done. I’ve not done as much as I would like, thanks to physical limitations, but I am making progress. I didn’t love the green color at first, but it is growing on me – nice job!!! What would you think about swapping the lamp and the candlesticks? The big plant on the left already adds a lot of weight to the left side….. I got two projects done and have 3 to go! BTW, I like the green on the credenza! I like the color green you chose. It works well with your sofa and gives you two large pieces that do not compete with one another. Hi Kristi, long time follower (since the days at the condo) and thought this was the perfect post for a comment. I got bit by the DIY bug and ended up painting my floors, building a fireplace, modifying custom curtains and repainting every surface of my house. Most of the projects are at 80% complete so knowing even the professionals do this makes me feel like I can actually finish. Actually, this blog has helped me be way more brave about starting new ideas and being bold and that it is okay to start over to get it right. Thank you for that. The green is fantastic, not too bold but not something that gets missed. Love it! I fell in love with this color as soon as I opened up this post! Somehow, I was never find of the previous color combo, and I feel bright white would have been short-lived in your house!! Wait….you’re not going to tell us how you got the white paint off the grasscloth!? I’m DYING to know!! !